Using WinXP, Cisco anyconnect VPN client here. Problem: VPN doesn't connect / Connects but "actually" not connected. Here are the steps. Step 1 is probably not needed but I am posting it just in case. Only Step 2 should fix it. Go to advanced tab > Advanced Port Forwarding Rules (http://192.168.0.1/adv_port.php) and configure like this: http://i.imgur.com/TVeIU.png ; Click save settings. 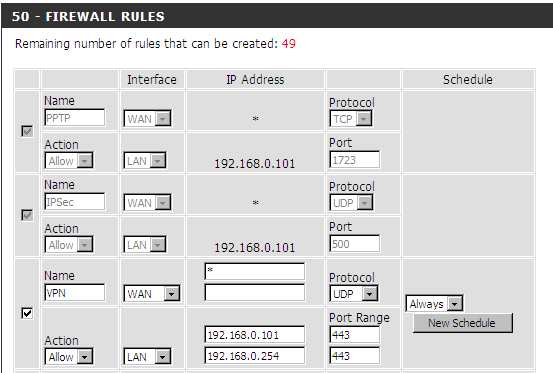 Now go to FIREWALL & DMZ SETTINGS (http://192.168.0.1/adv_firewall.php) and configure like this: http://i.imgur.com/5Uvyd.png (1st 2 entries are present if you've done step 1, the 2rd entry has to be done manually); Click save settings. Note: It's UDP-443 with Anyconnect, maybe a different port for a different VPN client. Find that and configure accordingly. Reply back if this worked with anybody else. just register new user and login to say thank you! This issue trouble me nearly half a year.